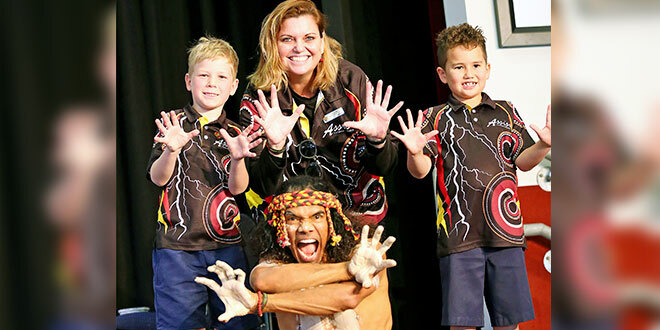 Cultural experience: Indigenous performer Sean Choolburra with Assisi Catholic College, Upper Coomera students Fletcher Taylor and Izaak Saunders and teacher Laurel Ball. ABORIGINAL performer Sean Choolburra weaved a blend of traditional dance, didgeridoo, story, knowledge and humour to help Assisi Catholic College, Upper Coomera, celebrate NAIDOC Week. With a background as a dancer in the Bangarra Dance Company the renowned stand-up comic and cultural ambassador rewarded students with a professional and inspiring cultural experience. For the Year 7-12 students Mr Choolburra’s performance was a captivating mix of storytelling, dance and stand-up comedy but he used more traditional dance and cultural practices to entertain and communicate with primary students. The response from the whole college community was overwhelmingly positive. Year 12 Aboriginal student Loriana Taylor said she was impressed with Sean’s performance. “Sean really connected to our sense of humour and was a great example of Aboriginal culture,” she said. Year 2 student Max Douse who was chosen to play the part of an echidna during the performance, said he loved the show. He said that he and his friends loved seeing how to make fire and how to play the didgeridoo. As Mr Choolburra walked around the college grounds at break time, students were high-fiving him and asking questions and telling him how much they loved his show, especially his dancing. Following the performance, a number of parents contacted the college to talk about the positive feedback their children had given them about the performance. Parent Tanya Allen said all her children arrived home raving about the performance while Tara Nardella said her children enjoyed the day. “Even my 15-year-old was impressed and that’s seriously impressive,” Tara said. Indigenous teacher Laurel Ball, who helped organise Mr Choolburra’s visit, stressed the importance of all students being able to experience indigenous guest speakers. “Sean is such a joyful representation of Aboriginal culture and seeing him helps our students foster a positive connection to Aboriginal people,” she said. Ms Ball said Mr Choolburra loved his day at Assisi College and he would love to return at any time. “He said that he tries to ‘not just be another school performer, but to give students a different experience that is totally positive’,” she said.